My story won this week! This is one that I was really happy with the way it turned out from the prompt. Read the previous post to see the story. It’s time to vote! 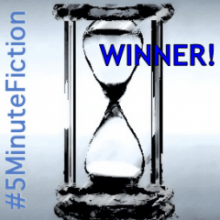 #5MinuteFiction finalists have been announced. So, go to Wendy’s site and read all the stories. I hope you’ll think that mine is the best as you read and vote. But hurry! You don’t have much time! Voting closes at 7:00 PM CST tonight…sometimes earlier! Describe something that you know through the POV of a character that has never seen it before. Traveling across the universe evokes some interesting stories. I remember the trip to Primesan 3. They were, at first glance not a very technological society. But then…. I remember seeing the small rectangular object. I picked it up and looked at it. It had a shiny side that glowed sometimes. When I turned it over, it didn’t shine, it was black. I knew it was unimportant – anything made of black had to be unimportant. Then, I hit a button. A Picture appeared on the shiny side. It appeared to be a picture of a young life form from the planet. I smiled. I had figured out that it was unimportant and now I realized it was merely a child’s toy. I did think the way of identifying which child owned the toy was ingenious. But what did it do? What was so exciting about this toy that could keep a child occupied. Surely it had to do something. I rubbed my hand across the picture, just to see if it would do anything. Miraculously it changed so that many pictures were on top of the child’s face. That didn’t seem like a lot of fun. I wondered if there was some kind of matching game to make the whole picture show up again. I tried pushing one of the pictures. I have no idea what happened, but all of the sudden pictures of gems started falling down. “This might cause a child to watch it,” I thought. “Demon! Witch!” I yelled and I threw it as far away as I could. As I watched the people, I realized that they must be enchanted by the witch – so many of them carried those boxes and held them to their ears to get a message from the gods.